An Austin Institution Ousted by Development In Austin, a beloved Tex-Mex cafe is preparing to move to make way for a giant new Marriott hotel, and people are plenty upset about it. The controversy has raised anew the question: Is success ruining Austin? 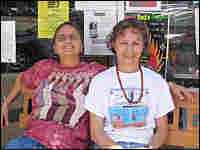 Sisters Cynthia (left) and Lidia Perez sit in front of Las Manitas cafe, a beloved Austin establishment that finds itself in the way of a giant new hotel complex. In Austin, a beloved Tex-Mex cafe is preparing to move to make way for a giant new Marriott hotel, and people are plenty upset about it. The controversy has raised anew the question: Is success ruining Austin? On the wall next to the cash register at Las Manitas restaurant is a framed letter signed by J.W. Marriott Jr.
"Dear Cynthia and Lidia," it begins. "Please accept my sincere apologies for my insensitive remarks that appeared in last week's Austin American-Statesman." That was a reference to the now locally infamous quote from Mr. Marriott: "Why should you hold up a several-hundred-million-dollar investment because of a small little restaurant?" He clearly didn't know Austin, or the fame of Las Manitas. Cynthia Perez, one of two sisters who own the restaurant, gives a tour of her kitchen, from which emanates some of the most acclaimed Mexican food in Texas. "She's burning the chile poblanos so she can pull back the skin, so she can make the zacatecan sauce," Cynthia says, watching an employee put a tray of green chilis in the oven. The narrow, shotgun cafe is popular with politicos, construction workers, guitar players and movie stars alike. Though its politics are decidedly lefty – it has hosted fundraisers for Sandinistas and Zapatistas — the clientele includes Karl Rove and Alberto Gonzalez, when they're in town. It has become, in the 26 years it has been open, one of the places that makes Austin Austin. "People are coming to Austin because it doesn't look like any other city," Cynthia Perez says. Her sister, Lidia, adds, "You want us to be the opposite of chain restaurants, and that's what we are." Last summer, Marriott Corporation announced a hotel complex that would generate 600 jobs and $7 million a year in taxes. The problem is, it's located on a downtown block of Congress Avenue where Las Manitas sits. Most other cities would drool over this kind of major downtown project, but not Austin. "As soon as this project was announced, there was a howl across this community, and I got a thousand e-mails and phone calls and stopped on the street saying 'Save Las Manitas. Don't let this hotel be built,'" says Mayor Will Wynn. Earlier this summer, the city — moved by the outcry — offered the restaurant a special loan of $750,000. But this time, citizens accused City Hall of favoritism toward the little cafe, at a time when other local businesses were struggling. Last week, the Perez sisters turned down the loan, saying it had too many conditions. So now the hotel developer and Las Manitas are back at the negotiating table. Las Manitas is only leasing its current property. Plans are for the cafe to move down the block to another building the Perez sisters own. And that's the sticking point. Marriott needs their say-so in order to build on the block. 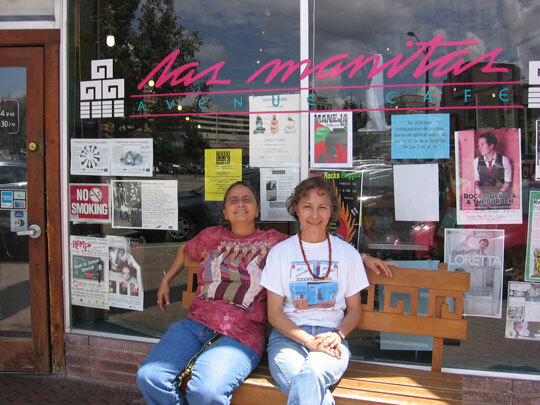 Lidia and Cynthia Perez estimate they'll need nearly $1 million to reopen Las Manitas in a new location, and they don't know where that's going to come from. So far, Marriott has offered them $72,000. A local attorney for the hotel developer would not comment on what Marriott's next move would be. Las Manitas regular Kevin Pape — digging into a plate of chicken flautas — says he's sure Las Manitas will survive in its eventual new location because of its loyal clientele. Nonetheless, "It's sad to see it go," he says. "I don't think we need the hotel here, frankly." When the original Las Manitas closes, and the hotel complex breaks ground — as most observers believe will happen — old-timers say the city whose unofficial civic motto is "Keep Austin Weird" will lose a little bit more of its soul.